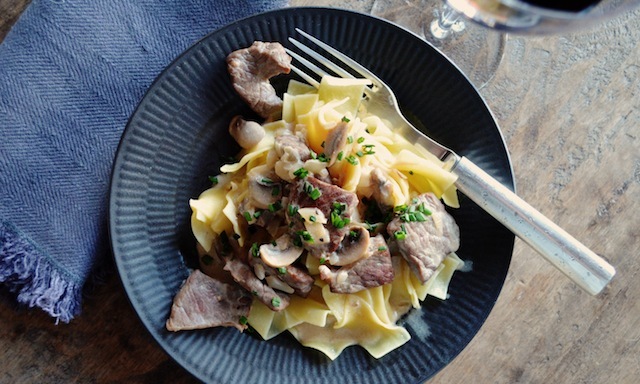 When I was growing up in Philadelphia in the 1970s beef stroganoff was the sort of thing my parents would serve at their dinner parties… or at least I think it was. Writing this, I realize the statement is based on an early memory, and we know how reliable memory is—particularly vintage ones. 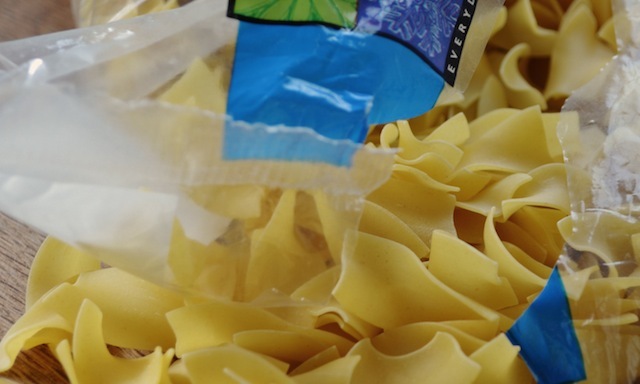 Be that as it may, I do seem to recall waking early one weekend morning when I was five or six years old, walking downstairs, and finding lots of dirty dishes scattered about the living room and kitchen—a number of them still smeared with egg noodles and a beefy cream sauce. I wiped many of those plates clean (gross, I know, but boy was it good). 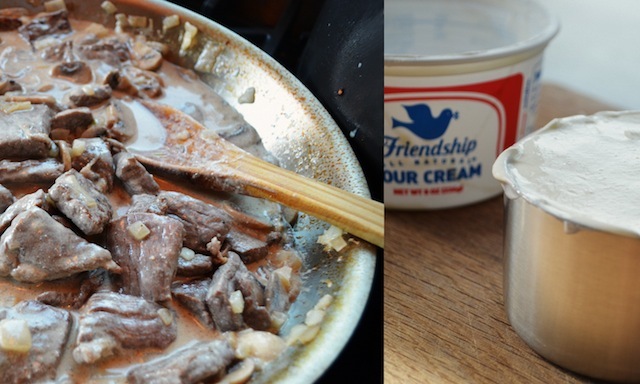 Having said that, I will likely now hear from my mom telling me that a) she’s never made beef stroganoff in her life, and b) she would never have gone to bed with dirty dishes piled on the coffee table. Maybe so, but ever since that (real or imagined) morning I’ve had a weakness for the dish, just as I will always associate it with the swinging ‘70s. It’s a recipe that doesn’t get nearly enough play these days. Not that I’m suggesting it’s something one should make a steady diet of. 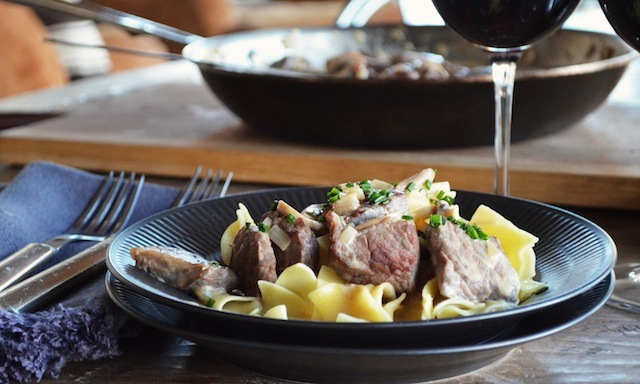 Cholesterol issues aside, one of the pleasures of beef stroganoff is that it retains a special occasion quality (and with the rich, hearty ingredients featured in the dish, it’s especially well suited to cold weather special occasions). It’s on a different level than beef stew of meatloaf, and I’m all for keeping it there. Still, no matter when you eat it, or how often, it’s a dish that deserves to be enjoyed far more than I suspect it is in this era of self-denial (juice cleanse anyone?). And given how simple it is to prepare, there’s no reason it shouldn’t be. So consider this my attempt to revive the popularity of one of my favorite dishes. 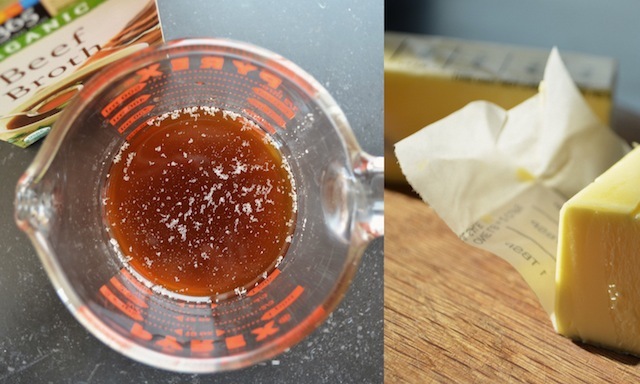 It’s actually something I’ve been planning for a while, since around the time (a year ago already) that I first tried the recipe presented below. With one thing and another, though, the moment never seemed quite right to post it, and so the dish got pushed to the back of the pile—until now. The recipe comes from the Feb/March, 2012 issue of Fine Cooking and immediately replaced all the other versions of the dish that I’d collected over the years. 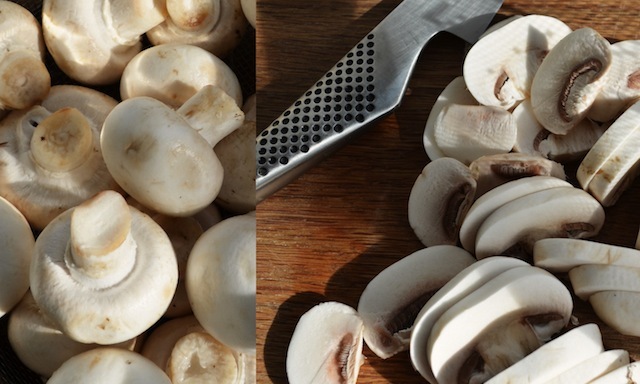 With its generous use of mushrooms and onions to bump up the flavor quotient, this one just comes closest to the combination of flavors and textures I remember from that first encounter. Add slices of lean, seared beef and a tangy sauce into the mix, and you have exactly the sort of thing that I start carving when the weather turns cold and wet (as it has here in the northeast during the past few weeks). Of course, credit for this must also be given to the presence of those egg noodles—the traditional American accompaniment to the dish (supposedly Russians serve it with potato straws, which doesn’t sound nearly as appealing to me). I’m a big fan of egg noodles, in part because they’re such a good canvas for whatever is layered on top of them. When that’s simply a few pats of butter it’s a good thing, but when it’s a creamy sauté featuring the various components mentioned above, it’s even better. On a cold winter’s night, what more could you possibly want? But before you answer let me share this: on a recent Sunday evening I whipped up a batch of said dish, and though we weren’t celebrating a birthday, or an anniversary, or a holiday, the meal was subtly elevated to special occasion status. In other words, no more winter chill, no more Sunday night anxiety, just great flavors on a plate, and a gratitude for being in a place—and with people—that I love. 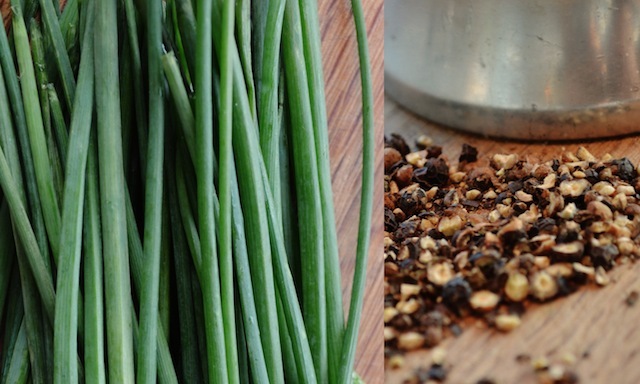 —Bring a large pot of well-salted water to a boil over high heat. 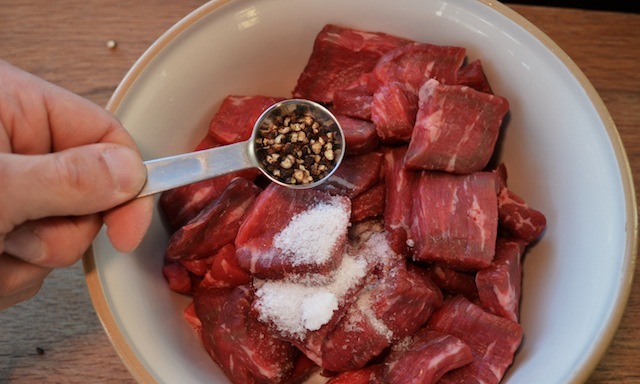 —Season the beef with 1 tsp salt and ¾ tsp pepper. Heat 2 tsp of the oil in a 12” skillet over medium-high heat until very hot. 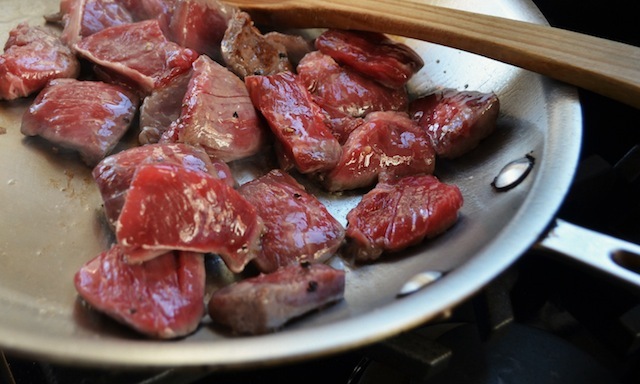 Add half of the beef and cook, stirring often, until the meat is just browned, about 1 minute; do no overcook. Transfer to a plate and repeat with 2 tsp of the oil and the remaining beef. —Remove the skillet from the heat. Add 1 tbs of the butter and the remaining 2 tsp oil to the skillet and stir until the butter melts. 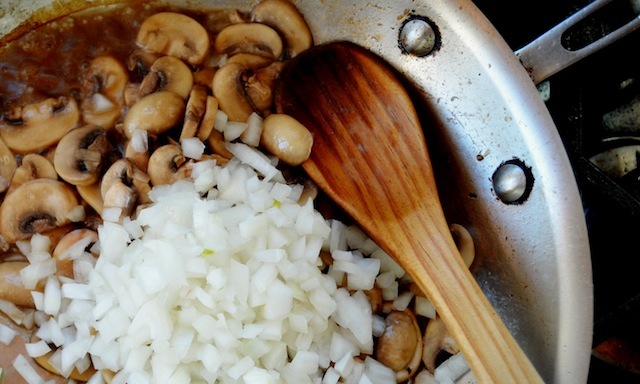 Put the skillet over medium heat and add the mushrooms. Cook, stirring occasionally, until the mushrooms release their liquid, about 5 minutes. Add the onions and cook, stirring occasionally, until the liquid has evaporated and the onions are beginning to soften, about 3 minutes more. —Meanwhile, cook the noodles in the boiling water according to the package directions until barely tender. Drain and return to the pot. Off the heat, add the remaining 2 tbs butter and stir to melt. Season to taste with salt and pepper. —Serve the beef over the noodles, sprinkled with the chives.